Don’t say that, please. I think I have been too nervous to hear this term because I turned 29 a while ago(would anybody say happy birthday to me?). Well, if you happen to be a teenager or in early 20’s, there’s nothing to worry about. But after you pass 25 or so, you would start to think about your future, especially marriage thing. Next? Maybe…home, child, or life after retirement. Too much to think about, but time sure goes by. Anyway, the first thing I have to start is 婚活[konkatsu] or spouse hunting. 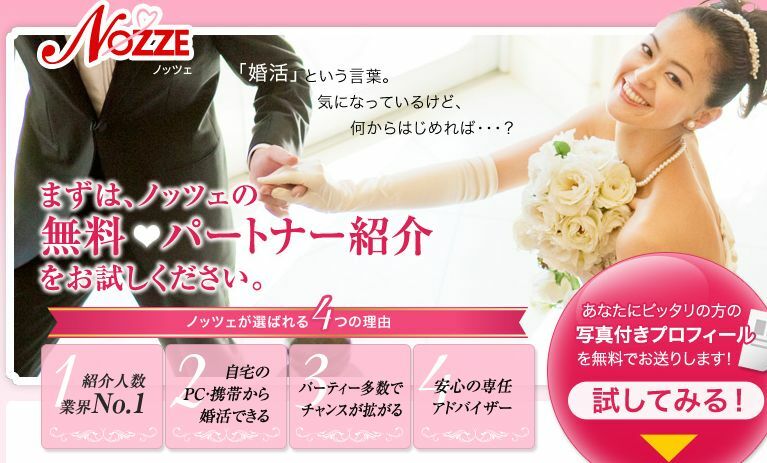 婚活 is an abbreviation of 結婚活動[kekkon katsudou] meaning to seek for your partner for marriage. This origins from 就活[shukatsu], that is an abbreviation of 就職活動[shushoku katsudou] or job hunting. This term was coined in the monthly magazine, AERA in 2007. When the sociologist, Masahiro Yamada talked about a marriage thing in the interview, he made this word. According to him, there are more and more people who can’t marry even though they want to. So that is why he thinks there needs an organization to assist them or whatsover. Why are there so many people who can’t marry? For one thing, men’s income seems to be decreasing whereas women want them to make more. Now, most men’s annual income is approximately less than four million yen(forty-seven thousand dollars) whereas women hope more than five million yen (sixty thousand dollars). It doesn’t match. But if you never marry, what will be waiting for you is…I think I have introduced here. I don’t believe it. Such a thing is kind of an invisible pressure named 婚圧[konatsu]. Don’t press me, please! At any rate, what kind of thing should we do? If you already have a girlfriend/boyfriend, just keep dating. But if not, you shall join a match-making party. We say 合コン[goukon] which is an abbreviation of 合同コンパ[goudou compa] where several men and women are to seek for a partner. You can speak to them one by one to get to know each other. Make sure you ask his/her phone number for your next date. But if you want to join such a party, you would have to either find an organiser or organise it. If you can do neither, you can talk to the marriage agency[結婚相談所]. You need to register, yes, of course you have to pay registeration fee and make sure you tell your height, education, and income. I tell you what, in fact I haven’t been to this kind of agency. That’s what I heard. Speaking of 婚活, I can think of the TV drama, 婚カツ！[konkatsu!] in which Masahiro Nakai from SMAP stars. The story starts from where a jobless man applies for a job. But when he knows only the married can apply, he lies he is going to marry soon. Because of this, he is obligated to start his 婚活. 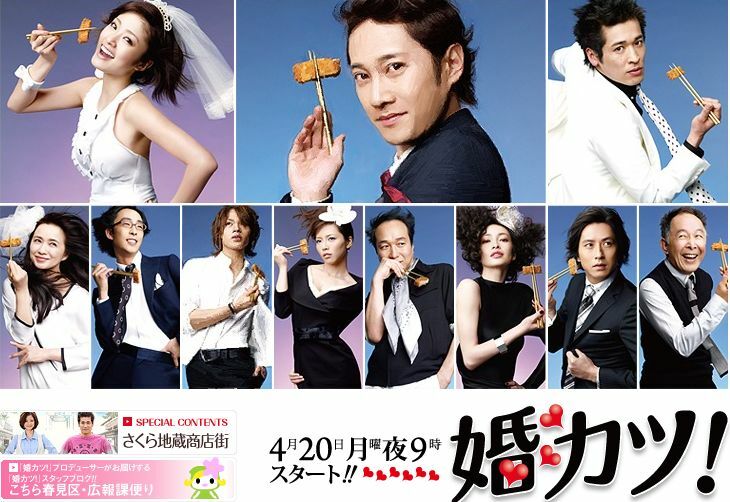 Personally, I prefer the hero in About A Boy or the one in 結婚できない男[kekkon dekinai otoko] or A Man Who Can’t Marry. Both of the heroes stay single because they don’t want to get married. Even though they are enough rich, they enjoy a single life. But in the end, they try to find a new life. I think there seems to be such a time for anyone, the time you really feel you need to change your life. Then you just change yourself. Nothing is too late. People around me sometimes say I should start 婚活. Yes I know I should. Sigh, it’s too difficut because there is at least three items I would like my future wife to accept. a. I am an otaku cosplayer. b. I am an otomen. c. Sometimes I cosplay characters from BL games. Almost all of my friends say the same thing,”Man, no girls will come to you for sure.” Yes, I know. Happy (really belated) birthday!!! My birthday was just yesterday! We are November kids! haha! Anyway, I think that of course, there will always be people who accept the way you are, or they might even cosplay along with you!!!! But….. I might start to think of it…….. soon. Just turned 24….. When I was learning Japanese, my teacher mentioned of the word “Christmas cake…..” Does this apply only to girls after 25 or also to guys as well? Christmas cake applies for girls only. And after girls pass 25, they shall be called toshi koshi soba because we eat it on December 31st. So you have six more years. Second, I am in the about the same boat as you but from the female side. I just turned 29 and I am cosplayer as well. So I wish you lots of luck in search. I hope someone would make a new society for cosplayers who seek for a partner! Some of us girls would happily accept points a, b, and c! In fact, I think it would be nice if there were some guys like that around here, LOL. And happy belated birthday to you! Then I should have been born in the west, haha. Well, once a fujoshi friend of mine said like, not I don’t like cosplayers, but I don’t want my boyfriend to cosplay. So I have to make sure before I date. That’s pretty weird that your friend would think so, but at least she told you the truth. Good luck with finding a girl that accepts your hobbies, I’m sure you can! And I forgot to mention, happy belated birthday!! Thank you very much! Yes, I hope so! happy (late) birthday! just wanted to say how much i enjoy your blog. seeing the comments above, maybe you just need a plane ticket, hm? Yes I want a plane ticket to go to a place where a guy like me can start konkatsu! I think that you’ll be able to find someone that accepts the things you like to do! I have a friend who met her boyfriend a few years ago at an anime convention while they were both doing cosplay for Naruto; now they are still dating and soon to be engaged to get married. So guys who have the same or similar hobbies to yours will *definitely* find someone. 😀 I certainly believe that you will find someone special when the time is right! Really? Then should I join an anime convention, haha. cosmosmith: Thank you very much! Oh isn’t there any fudanshi in America? I think they are in the closet. You should take them out! Don’t worry, Bangin-sensei. Marriage is not for everyone! I am sure that you can be happy outside of marriage. Hi how’s it going lately? Charana: Thank you ver much. 🙂 I wish I could find someone! you have a higher chance of getting someone rather than me =w="
for me, i am the seme in the relationship soooo… ughhh =-="
Ahaha, is that so? I will wait for the time coming! Ah…. it’s nearing Christmas already. Where can I find those kind girls? I kinda have the same problem around here. Here, girls are rised to study, being proffesionals and get married quickly; I’m just 18, and my former girl partners from school wouldn’t believe that I didn’t want to get married/have children soon,l because there’s many things I want to do. I think I would get married with a man that accepts that I’m a otaku and that I’m not that femenine (I really dislikes how other girls spend hours just to put make up). Myabe I’ll look for you if I go to Japan one day XDDDD (or my girl-friends xDD).